New Training posted March 25, 2019 Training Schedule! New Book: "Tales of Military Service" available on Amazon and at other locations. Also available on Kindle at Amazon. Find it -> Hear Lead Author: Terry Sparks with 23 other authors. 3rd Edition: What you need to know about Cruising. The book identifies everything else you need to know about cruising besides the basic sailing or boat driving. There is a lot more to Cruising than boat driving. Also World Group ID information. And now it is in Spanish! This book is for anyone that is planning to buy and install HF SSB radio on their boat. It includes planning, licensing, buying, installing, setup, email, and testing. 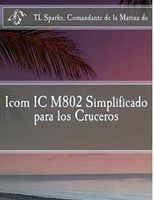 This book also includes enhanced procedures from my popular “Icom IC M802 Made Simple for Cruisers” The only book you need for the Icom IC M802 HF SSB radio to help you with the purchase, installation, and ultimate daily use this great Icom radio. An New Ham I Am - Made Simple for Cruisers bridges the gap between getting a license and using the license. HF SSB communications nets provides excellent practice in using and understanding the anomalies of HF SSB radio and meet other cruisers. Cruisers are frequently in foreign countries, may not speak the local language, understand the culture, or laws. If you need help getting to know other cruisers in your area can be really important. If you are cruising you will need help at some time. This book is for anyone that is boating, fishing or Cruising in the ocean. The book explains the changes to world with respect to communications and most importantly how to get help at sea. Find out why commercial vessels never answer and how to change that. Cruising Log Made Simple for Cruisers can help you keep track of your cruising voyages. You need to keep track of your travels and this is a simple way. The book is set up so that you can have many volumes. The book also has some valuable tables and a maintenance log. All your boat activity in one place.